150 meters (or 492 feet): Length of largest kite, a train of small diamond kites in an alternating Japanese flag and American flag design. SEAL BEACH – From a pirate ship and Red Baron plane to a butterfly and 40-foot macaw, the sky above the Seal Beach Municipal Pier was dotted with more than 100 colorful kites on Sunday at the 17th annual Japan America Kite Festival. About 15, 000 people attended the free, one-day festival to fly a kite and learn about Japanese kites and culture. The event offered a children’s kite workshop, Japanese food, music, origami and kite flying demonstrations, and other activities. The festival was presented by Japan America Society of Southern California, Up Up and Away Kite Shop of Seal Beach and Up Up and Away Kite Club. 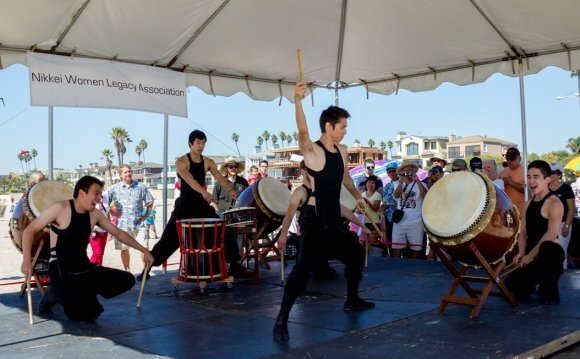 Douglas Erber, president of Japan America Society of Southern California, said the festival teamed with his organization in 2001 to promote Japanese-American relations and culture. Organizers say it is the largest Japanese-themed kiting event outside of Japan. While the sky was filled with mostly American kites, usually made of ripstop nylon and a nylon line, it was the traditional Japanese kites made of bamboo, silk and Japanese washi paper that were gaining attention on ground. Edo kite master Mikio Toki, who has traveled from his native Japan to the festival since 2001, displayed his traditional, hand-painted kites featuring characters from Japanese folklore and kabuki theater. Toki’s edo-dako or traditional, “Tokyo style” kite designs are sought after around the world, Erber said. During the festival, Toki propped up a nearly 500-foot train of diamond-shaped kites that alternated Japanese and American flags. He said flying kites captures a joy that transcends both cultures. Burbank resident Robyn Palmer, 28, was flying one of the children’s kites from the festival’s workshop. She enjoyed seeing children and adults around her experiencing the childlike joy kite flying can bring. Seal Beach resident Su Wong, 41, said she liked the Japanese cultural aspect of the festival and its family-friendly setting. While waiting to watch traditional taiko drummers perform, she also held onto her daughter’s smaller kite, giving it a whirl in the sky. Big Kites - Japan America Kite Festival, Seal Beach, CA.